A fascination with the inherent complexity, even hypocrisy, of human nature seeps from the brooding, slightly off-kilter tales spun by Wellington-based novelist Neil Cross. Throughout six previous books, bleak yet menacing settings are populated with characters neither starkly good nor evil, but smudged shades of grey. The thing is, only five of those books were fictional. 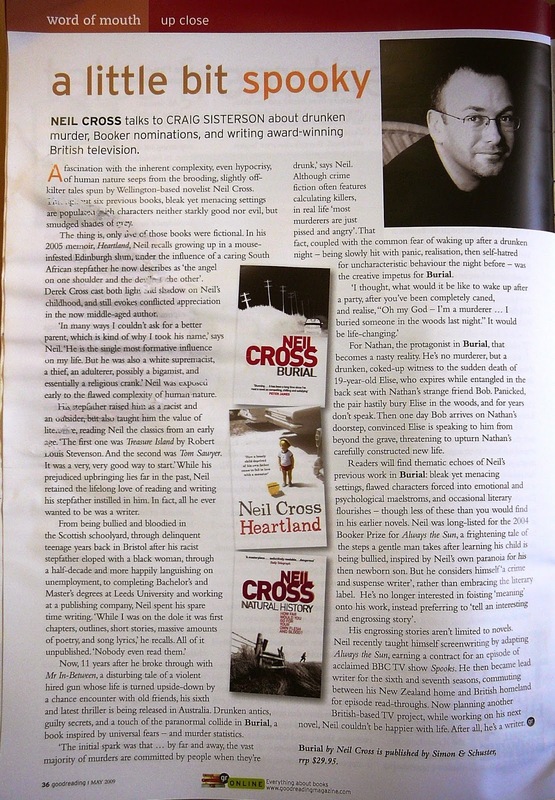 In his 2005 memoir, Heartland, Cross recalls growing up in a mouse-infested Edinburgh slum, under the influence of a caring South African stepfather he now describes as “the angel on one shoulder and the devil on the other”. Derek Cross cast both light and shadow on Neil’s childhood, and still evokes conflicted appreciation in the now middle-aged author. “In many ways I couldn’t ask for a better parent, which is kind of why I took his name,” says Cross. “He is the single most formative influence on my life. But he was also a white supremacist, a thief, an adulterer, possibly a bigamist, and essentially a religious crank.” Cross was exposed early to the flawed complexity of human nature. His stepfather raised him as a racist and an outsider, but also taught him the value of literature, reading Cross the classics from an early age. “The first one was Treasure Island by Robert Louis Stevenson. And the second was Tom Sawyer. It was a very, very good way to start.” While his prejudiced upbringing lies far in the past, Cross retained the lifelong love of reading and writing his stepfather instilled. In fact, all Cross ever wanted to be was a writer. Now, eleven years after he broke through with Mr In-Between, a disturbing tale of a violent hired gun whose life is turned upside down by a chance encounter with old friends, his sixth and latest thriller is being released in Australia. Drunken antics, guilty secrets, and a touch of the paranormal collide in Burial, a book inspired by universal fears and murder stats. “The initial spark was that… by far and away, the vast majority of murders are committed by people when they’re drunk,” says Cross. Although crime fiction often features calculating killers, in real life “most murderers are just pissed and angry.” That fact, coupled with the common fear of waking up after a drunken night – being slowly hit with panic, realisation, then self-hatred for uncharacteristic behaviour the night before – was the creative impetus for Burial. For Nathan, the protagonist in Burial, that becomes a nasty reality. He’s no murderer, but a drunken, coked-up witness to the sudden death of 19-yr old Elise, who expires while entangled in the back-seat with Nathan’s strange friend Bob. Panicked, the pair hastily bury Elise in the woods, and for years don’t speak. Then one day Bob arrives on Nathan’s doorstep, convinced Elise is speaking to him from beyond the grave, and threatening to upturn Nathan’s carefully constructed new life. Readers will find thematic echoes of Cross’s previous work in Burial; bleak yet menacing settings, flawed characters forced into emotional and psychological maelstroms, and occasional literary flourishes – though less of the latter than earlier in his career. Cross was long-listed for the 2004 Booker Prize for Always the Sun, a frightening tale of the steps a gentle man takes after learning his child is being bullied, inspired by Cross’s own “Travis Bickle sort of “ paranoia for his newborn son. But he considers himself “a crime and suspense writer”, rather than embracing the literary label. He’s no longer interested in foisting ‘meaning’ onto his work, instead preferring to “tell an interesting and engrossing story”. His engrossing stories aren’t limited to novels. Cross recently taught himself screenwriting by adapting Always the Sun, earning a contract for an episode of acclaimed BBC TV show Spooks. He then became lead writer for the sixth and seventh seasons, commuting between his Wellington home and British homeland for episode read-throughs. Now planning another British-based TV project, while working on his next novel, Cross couldn’t be happier with life. After all, he’s a writer. This feature article was originally published in print form in Good Reading, a popular books magazine from Australia, in mid 2009.